Enjoy a huge library of TV on demand at no extra cost with Sky TV and Sky Broadband Unlimited. Sky Go lets you watch all five Sky Sports channels and four Sky Movies channels on the move on a range of devices. Its only available with Sky. Specialists in Sky installations, repairs & high access installs. If you’re having problems with your Sky satellite dish our team of professional installers can help you. As the current market leader in mainstream digital TV, Sky is responsible for entertaining a huge audience every single day. With a variety of channels to choose from you’ll always find something of interest to watch, but what happens if your satellite signal suddenly fails? Having Problems with your Sky Reception? In our experience, all Sky TV systems will eventually have problems. Due to many reasons such as the satellite dish being knocked out of alignment, the cable needing replacing due to corrosion, faults with the satellite receiver box, the list goes on. However we're here to help!!! If your dish has moved and you are experiencing picture freezing, poor quality or any other problem, we can offer a low cost re-alignment, dish or LNB repair or replacement service at low prices. Want to watch Sky TV in more than one room? With the use of infrared emitters, you can control your Sky TV Channel, DVD player and DAB Digital Radio stations from any room in your home, and with the integration of further digital television set top boxes, you can also free your home of fights over the TV remote, being able to watch more than one TV channel in your home at the same time. No more arguments over the remote control!!! Moving House, Need your Sky Re installing? If you are moving home, you most likely want to keep hold of your satellite system and keep on receiving you Sky TV. On the day of your move we can dismantle and re install your complete system, all before you have completed your move. New cable will be required and any parts that need replacing can be replaced at this time. Re installation of your satellite system will be completed ready for your first night in your new home. Special heights or discreet satellite installations. 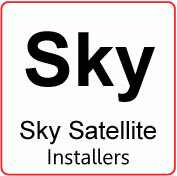 Have Sky refused to install your satellite system due to the height of accessibility? If so don't worry. In 9 out of 10 cases, Julian Voigt Aerial & Satellite Services can install your system no problem! Are you requiring a discreet installation? We can work with you an where the dish is to be fitted , and we can often find a good position with good signal to suit your needs. Julian Voigt Aerial & Satellite covers the North West of England:- Lancaster, Morecambe, Preston, Blackpool, Fleetwood, Lytham St.Annes, Southport, plus surrounding area's.